Since we first reported dates for next year’s Holy Ship!!! - a three-night cruise (January 9-12, 2014) where EDM rules the high seas - ravers and dance enthusiasts alike waited in high anticipation for which DJs would be turning the deck on one of the hottest party boats in history. Today, the event’s sponsors and organizers (HARD Events, Cloud 9 Adventures and The Bowery Presents) have revealed a list featuring the Holy Ship!!! 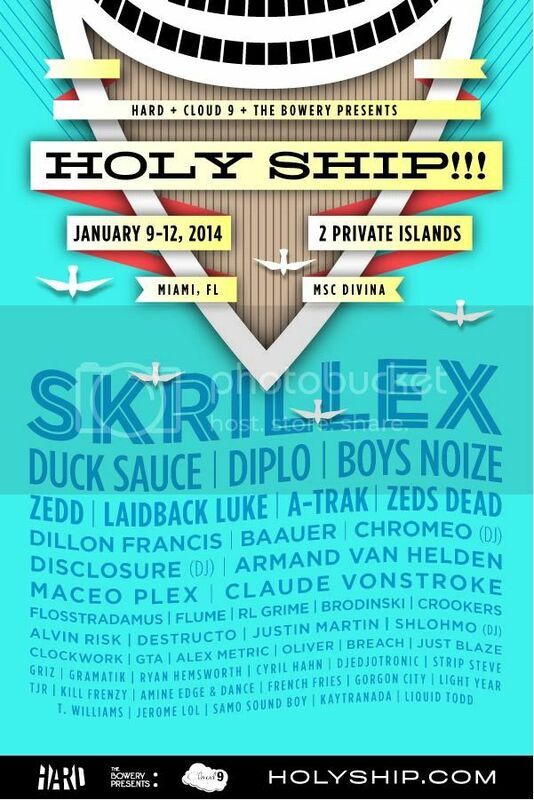 's official lineup, which includes heavy hitters Skrillex, Duck Sauce, Diplo, Boys Noize and Zedd among others. On top of this impressive lineup, ship riders will also have the opportunity to enjoy workshop activities and interactions with the artists, as well as two private island beach parties. Already starting to salivate? Sadly, pre-booking for next year’s Holy Ship!!! had close within minutes due to high demand, but those who missed out can still join the event wait list.